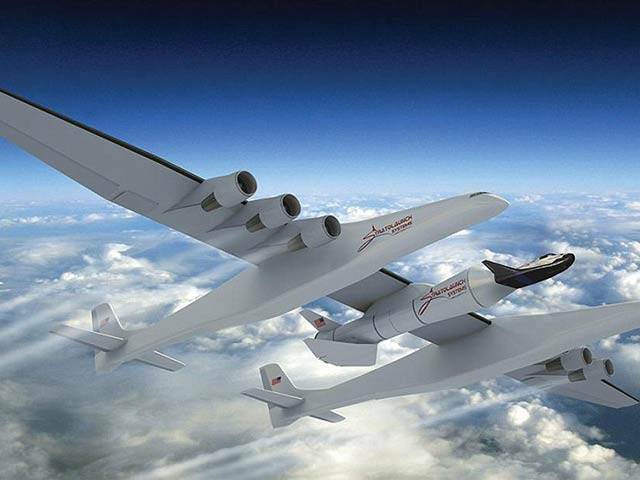 Microsoft’s co-founder Paul Allen has announced to make world’s largest plane that can also send people in space. After its completion, this plane will be larger from Howard Hughes H – Hercules plane of 1947. It will be possible to sent small space shuttle directly in the orbit after taking the plane at height. It means the space shuttle can be launched from a plane. The plane ‘Stratolaunch’ comprises of two fuselages in which there are 6 engines, a landing gear and other important parts while its structure is prepared with special light material. After its completion, it will be sent to maximum height in space and send the space shuttle in orbit. Its wingspan is 117 meters and it has 6 engines of 747 class. Strative Launch can also send small satellites in the space. Its first take off is expected in 2018 while it will be available for business production till 2020. According to reports, its 76% part has been prepared which can prove a milestone in personal space vehicles.